In his research on the topic of this esteemed holiday, filmmaker and scholar Mike Vogel has confirmed there are archeological bones and horns in dirt type of evidence. In addition contemporary observations corroborate that it is not merely legend that the great city of Portland, Oregon was built upon an ancient unicorn burial ground. On St. Unicorn’s Day, we drink to remember, instead of our usual reason, drinking to forget. 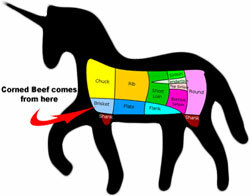 It is also traditional to feast on [uni]corned beef and boiled cabbage and root vegetables on this day (if some of this sounds familiar, it is because, like so many religious holidays, St. Patrick’s Day is actually based on an old pagan celebration: St. Unicorn’s Day). To all Portlanders everywhere, I wish you a fantastic St. Unicorns Day! 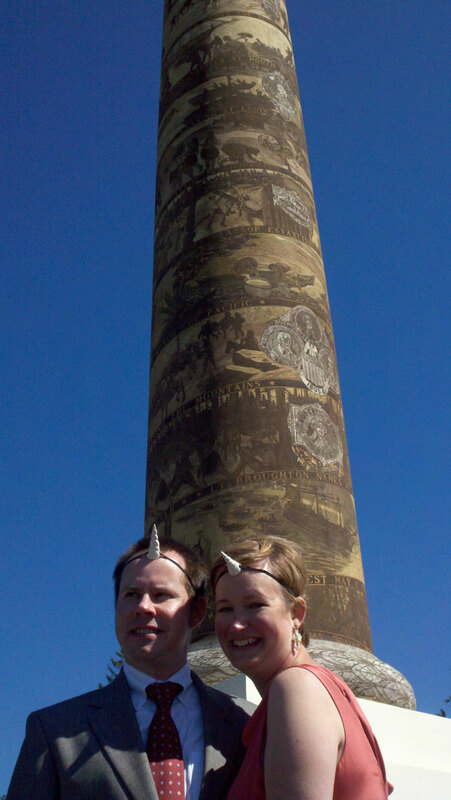 On our wedding day last summer, Heather and I paid homage to our unicorn [Ed: and dork] heritage.